On September 29, 1999, Charles Hanley and his coworkers at the Associated Press stunned the world with their Pulitzer-winning investigative story of U.S. GIs shooting several hundred women and children in their care by a bridge near the Korean village of Nogunri (also spelled Rogun-ri or No Gun Ri) on July 26, 1950. The massacre of innocent civilians by American troops was, of course, well-known among the victims and their relatives, but the Seoul government had for years labeled anyone mentioning the massacre "communists," and brutally prosecuted them. Ironically, it took a fair-minded American journalist to disclose the massacre. Once the story broke and grabbed headline attention, the victims began to step forward. The Seoul government was placed between a rock and a hard place. Continuing to muzzle the victims would strengthen the notion that the Seoul government was a mere puppet of Uncle Sam. After all, its main reason for suppressing the story was to please him. Yet, allowing the whole ugly truth to come out in the open would open up a Pandora's box, because the Korean people would want to know why their government failed to protect their citizens from foreign troops and why they had not done anything for the victims -- or even, worse, why they had been persecuting the victims and their relatives (Nogunri Victims' Association, 2002). The site of the massacre as it looks today. Soon after the AP story broke, a BBC investigative team made an independent investigation of the massacre and aired its findings in a TV documentary (Williams, Lee, 2005). Their findings supported the AP story and debunked the claim that a handful of bad apples committed the atrocious crime of killing unarmed women and children of an ally supposedly under U.S. military protection. On the AP disclosure and surprised by the intensity of anti-American sentiment in South Korea, the Pentagon formed a special commission to look into the matter in late 1999. 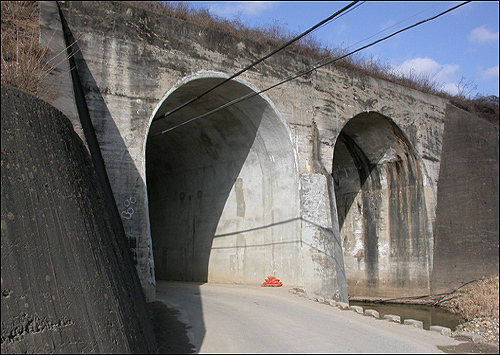 The Pentagon investigators studied more than one million records from the National Archives, interviewed about 200 veterans of the Korean War and about 75 Korean witnesses, and found that young, greenhorn troops did indeed fire on women and children sheltering under a railway bridge in July 1950 (US Department of Army Inspector General, 2001). The Korean villagers stated that on July 25, 1950, U.S. soldiers evacuated approximately 500 to 600 villagers from their homes in Im Gae Ri and Joo Gok Ri. The villagers said the U.S. soldiers escorted them towards the south. Later that evening, the American soldiers led the villagers near a riverbank at Ha Ga Ri and ordered them to stay there that night. During the night, the villagers witnessed a long parade of U.S. troops and vehicles moving towards Pusan. On the morning of July 26, 1950, the villagers continued south along the Seoul-Pusan road. According to their statements, when the villagers reached the vicinity of No Gun Ri, U.S. soldiers stopped them at a roadblock and ordered the group onto the railroad tracks, where the soldiers searched them and their personal belongings. The Koreans state that, although the soldiers found no prohibited items (such as weapons or other military contraband), the soldiers ordered an air attack on the villagers by radio communications with U.S. aircraft. Shortly afterwards, planes flew over and dropped bombs and fired machine guns, killing about 100 villagers on the railroad tracks. Those villagers who survived sought protection in a small culvert underneath the railroad tracks. The U.S. soldiers drove the villagers out of the culvert and into the larger double tunnels nearby (this report subsequently refers to these tunnels as the "double railroad overpass"). The Koreans state the U.S. soldiers then fired into both ends of the tunnels over four days (July 26-29, 1950), resulting in approximately 300 additional deaths. The U.S. Army report stated there was no proof the massacre was ordered by American commanders. After the publication of the Army report, then President Bill Clinton issued a statement of "regret" for the killing of Korean refugees. Bill Clinton's "regret" was not the formal apology many South Koreans demanded. The U.S. military made a friendly gesture to the victims to pay one million dollars for a monument to the victims and set up a $750,000 scholarship (Virtual Truth Commission, 2001). There would be no compensations to the victims. As far Washington was concerned, that was the end of the story -- no more investigation and no more money. The case was closed. Period. The Korean victims refused to accept that their case is closed and formed a legal entity -- the Nogunri Victims' Association -- to carry on their fight. The Seoul government continues to stonewall the case and, in fact, tried to erase any physical evidence of the massacre. (Nogunri Victims' Association, 2002). The tragedy at Nogunri that happened so many years ago in 1950 was headed toward oblivion as most of the survivors died and their relatives went on with what was left of their lives. Then early this year, a historian at Harvard University (Sahr, Cinway-Lanz, 2005) published an article on Nogunri in the journal, Diplomatic History. Sahr uncovered a secret diplomatic cable from Ambassador to Korea John J. Muccio to the State Department on a high-level decision to shoot Korean civilians, which directly and explicitly contradicts the U.S. Army report and Bill Clinton's claim that the massacre was committed by a handful soldiers on their own. But there exists an account of the meeting that the Pentagon investigation and other inquiries have missed. On 26 July, the American ambassador to Korea, John J. Muccio, sent a letter to Dean Rusk, the assistant secretary of state for Far Eastern affairs, about the refugee problem in Korea. The letter described the problem as having developed "a serious and even critical military nature." The letter told Rusk that the ambassador was writing because the military was "necessarily" making decisions about the problem, and the implementation of these decisions had the possibility of repercussions in the United States. The letter described the military problems of clogged roads and infiltration that the movements of refugees caused. It then reported to Rusk that a meeting had been arranged by request of Eighth Army headquarters at the office of the South Korean home minister on the evening of 25 July to address this problem. The letter said that the administration and personnel section (G-1), the intelligence section (G-2 ), the provost marshal, and the Counter-Intelligence Corps of the Eighth Army staff were represented at the meeting along with the American embassy, the ROK Home and Social Affairs ministries,and the director of the National Police. "Leaflet drops will be made north of U.S. lines warning the people not to proceed south, that they risk being fired upon if they do so. If refugees do appear from north of U.S. lines they will receive warning shots, and if they then persist in advancing they will be shot." The letter also reported that refugees would be warned that no group could move south unless so ordered and then only under police control. All movement of Korean civilians had to end at sunset or those moving would "risk being shot when dark comes." Sahr allows some benefit of the doubt on behalf of the Pentagon. It is not certain that Muccio was at the meeting in person and it may be that he heard about the meeting second-hand. Or it may be that the ambassador's memory was faulty. Sahr believes this unlikely because there are other independent sources that support Muccio's claim. For example, the 8th Cavalry log states that the order to shoot civilians came from above. Several shooters claimed that they were ordered to shoot the women and children hiding under the bridge. In fact, evidence supports the claim that U.S. troops killed civilians all across the war zone. Henry, C.J., Choe, Sang-hun, & Mendoza, M. (2002). The Bridge at No Gun Ri. Owl Books.